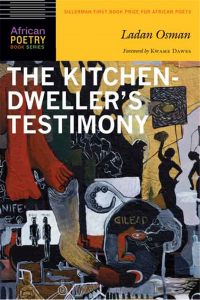 Sillerman Prize winner Ladan Osman’s The Kitchen-Dweller’sTestimony received a positive and insightful review in the Fall online issue of Rain Taxi. Wesley Rothman praises the collection as “wildly imaginative” and recognizes that the poems “carry us into spaces we rarely access in daily life” in order to effectively examine the claustrophobic realities of race. The full review can be read here, and don’t forget that submissions to the Sillerman First Book Prize for African Poets are free and open until December 1st.